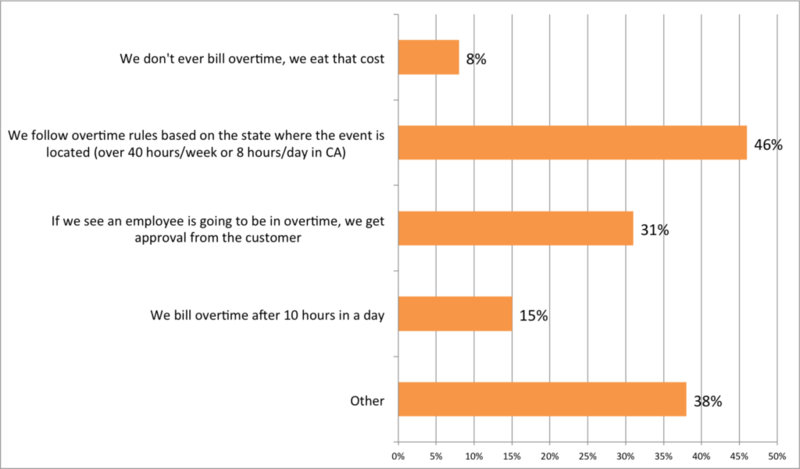 How Do Event Staffing Companies Bill for Overtime? In a previous event industry survey, we asked the question – “how do you pay your employees & freelancers overtime”? In our most recent survey, we wanted to better understand the other side of the coin – how are companies charging their clients for overtime hours worked? Are they following the same rules with which they pay their employees overtime? Are they eating that cost? Are they getting client approval prior to billing overtime hours? This is what we wanted to know. How do you bill your customers for overtime hours worked? Let us know if it differs from this! Overtime rules and requirements just to stay compliant are complex enough to navigate. When you add trying to figure out what and how to bill your customers for overtime hours so that those costs don’t eat into your profits, overtime can be an even more frustrating obstacle. That is why it’s so important to be able to easily understand overtime costs and how they will impact your bottom line – at all times. On top of many other benefits, LASSO helps you do just this. Schedule your live demo today to learn more. Also, make sure to take advantage of this overtime rules by state infographic & map and let us know what you would like us to poll the industry about next!